Equine Fusion Pair of Comfort Pads. Comfort Pads Are Easy To Apply and Exceptional Value For Money. Helping Bring a Natural Balance Back to Your Horse or Pony! These Pads fit the complete Equine Fusion hoof boot range including regular and the slim fitting models. Just choose the same size to match your existing Equine Fusion hoof boots. Equine Fusion Comfort Pads are the ideal compliment to the Award Winning Equine Fusion range of hoof boots. The comfort pad is a flat pad designed to increase comfort and reduce concussion. Comfort pads increase heel comfort so that all horses - sound or unsound- are encouraged to move correctly. Comfort pads can also be a useful tool to improve the fit of a boot. A comfort pad will provide cushioning, additional protection and and shock absorption to the hoof as well as support to the frog. Comfort pads are an excellent aid in transitioning a horse from shod to barefoot, and exercise both the internal and external structures of the hoof to help build a stronger hoof capsule. Equine Fusion Dampening Pad adds a new dimension to the pads and the dampening expression. 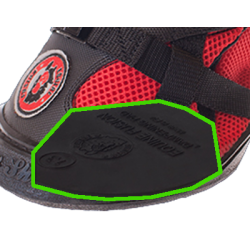 The pad is designed according to the same principles as the jogging shoe. With a special designed rubber compound which provides the Pad with the best properties. Equine Fusion Dampening Pads will contribute to make the jogging shoes even better, for both riding on hard surfaces and rehabilitation of hooves.